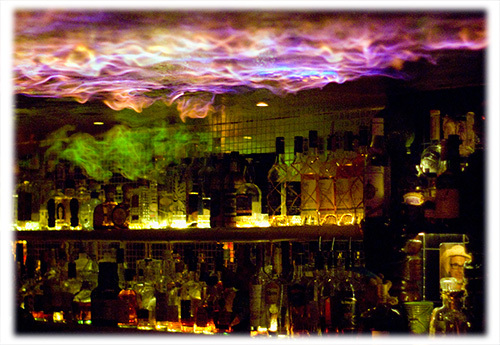 Tag-Archive for "Banks 5 Island Rum"
Having missed out on the last Rum Club of 2011, I was really looking forward to starting the New Year at Trailer Happiness‘ Notting Hill Rum Club. And I can happily say that I wasn’t disappointed. 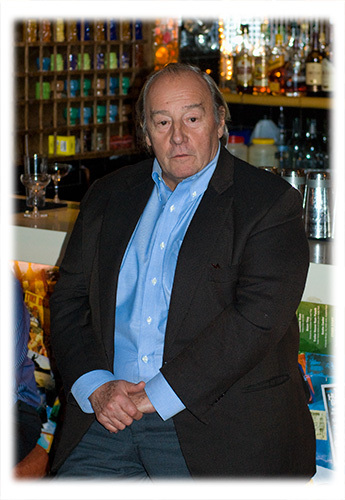 Having first come across Banks 5 Island Rum at September 2011’s Boutique Bar Show, I thought I knew what to expect of the evening’s rum tasting and that it would be more of an opportunity to catch up socially, with the other rum club members. So it was a pleasant surprise to find out how wrong I was. Not only did I get the chance to reacquaint myself with this distinctive white rum, but we were also introduced to its more complex brother, Banks 7 Golden Age. Ensuring that good things often come in three’s, James Triffo of Spirit Cartel also brought along the Banks Rum Master Blender, Arnaud de Trabuc, who talked us through our exploration of the evening’s rum and how Banks came to be. So following a uniquely Banks 5 Island Daiquiri made by the bar team of Alex and Paul McFadyen (covering for Max and Damien), we sat down to listen to James and Arnaud explain the concept of Banks Rum. Named after the 18th Century explorer and botanist, Sir Joseph Banks, who sailed with Captain James Cook on his first scientific expedition to the South Pacific Ocean aboard HMS Endeavour. As well as introducing the Western world to many plants, such as eucalyptus, acacia, mimosa and Banksia, Sir Joseph Banks was also influential in the propagation of sugar cane in the Caribbean. In this light, Banks Rum attempts to capture the spirit of this English naturalist by bringing together different rums from both the Caribbean and the Indian Ocean to create a distinctive premium rum. 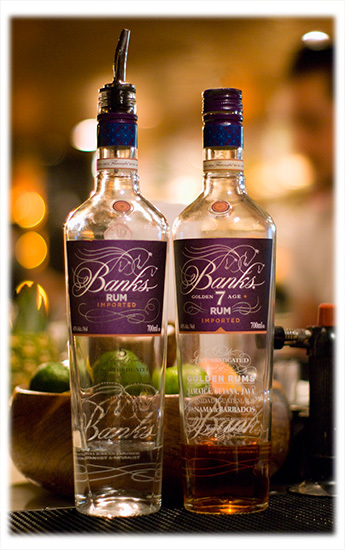 Conceived in 2009 it took 14 months of blending and sampling, before Banks 5 Island Rum was introduced to America in June 2010 prior to it arriving on the UK shores in March 2011. It is a blend of 21 different rums aged between 1 and 5 years old from 6 different distilleries on 5 different islands: Barbados, Guyana, Jamaica, Trinidad and the Indian Ocean island of Java. The blend is then aged further in used Bourbon barrels in Amsterdam, before it is then charcoal filtered to remove the colour prior to it being slowly cut with Dutch water to a bottling strength of 43% ABV / 86 Proof. The aroma is noticeably of grassy sugar cane, almost reminiscent of Brazilian Cachaça or Rhum Agricole, while the taste starts with smooth, grassy, tropical fruit flavours, that always reminds me of the British Parma Violets sweets. It finishes with a slightly sweet spiciness. To describe this rum as unique is not an understatement, it really is unlike any other rum that I’ve tried and it’s one that continues to provoke mixed feelings for me. There’s a lot to like about this rum and I can see it being a really interesting premium white rum for a good mixologist to play with the distinctive and complex flavours. However, that same complexity that I see as allowing a creative expression is also the same complexity that I personally think is too much in some simpler cocktails, such as the Cuba Libre or the Daiquiri. As such I don’t see this as being my go-to white rum but more of a playful premium mixing rum. Our other rum of the evening was the soon to be introduced Banks 7 Golden Age Rum and what a treat it was. Aged between 1 and 7 years, this is a blend of 23 rums from 7 different islands: Barbados, Guatemala, Guyana, Jamaica, Panama, Trinidad and the Indian Ocean island of Java. Unfiltered, the addition of the Guatemalan and Panamanian rums give this dark amber rum a sweeter and lighter taste than Banks 5, while still retaining some of the spicy finish. Like Banks 5, it is also bottled at 43% ABV / 86 Proof. For me this was the highlight of the evening and I would not hesitate to recommend it to anyone who likes rum. It’s worth noting that the complexity of both of these rums is due to the distinctive blend of rums. From the simple, but strong Trinidadian rums to the full-on flavour of the pot-distilled Jamaican rums via the fruity Guyanese rum and the elegant and spicy bite of the rums from Barbados. Lastly and possibly the most distinct element in the blend is the addition of the Batavia Arrack from Java, which adds a touch of spice, along with the fresh sugar cane notes. In addition, the Banks 7 Golden Age Rum adds the sweet Solera rum from Guatemala, as well as the smooth flavours of the rum from Panama. To round of the evening’s tasting, James teased us with a hint of Bank’s next rum, which will be named in honour of HMS Endeavour. Without a sample available for the evening, there’s not really anything more that can be said about Banks Endeavour Rum at this point, but if it’s as good as their Golden Age rum it will be worth waiting for. Watch this space for future news. As usual, my thanks to Max and the Trailer team for yet another great Rum Club and to James Triffo of Spirit Cartel for a wonderful evening with Banks Rum. Details for the next rum club are still pending, so please keep an eye on the Rum Diary for any update. For those interested in learning more about the London Rum Club, please either visit the website or pop into Trailer Happiness and speak to the bar staff.